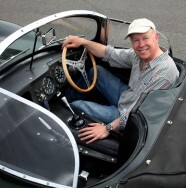 James Mann is a dyed-in-the-wool car and motorcycle nut. Born in London in 1963, James went to some of the final races at Crystal Palace with his father as a lad and rode motorcycles at the earliest opportunity. James studied Editorial and Advertising photography at Gloucester college of Art and Tech’ before landing a job on Classic and Sports Car Magazine in 1989. Since then he has traveled all over the world photographing, people, cars, landscapes and events and his pictures have been seen in over 50 books, hundreds of magazines and he’s still coming up with new ideas for subjects, shoots and styles to suit clients. He lives in Dorset with his wife and two children.